Churchill Brothers Sports Club’s defensive frailties came back to haunt them as Bengaluru FC feasted on the opportunities for a 3-1 victory at the Duler Stadium, Goa, on Friday. 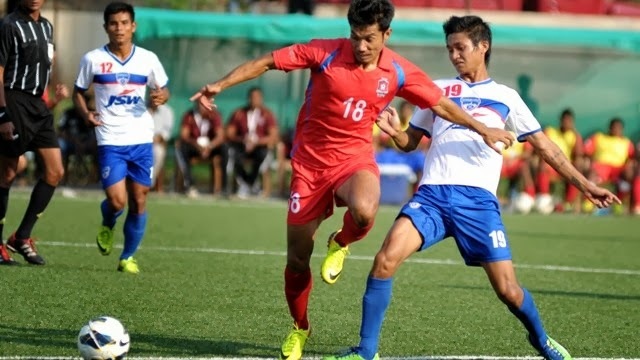 Bengaluru FC started cautiously and had to wait for a long time to create openings. But after a dull 45 minutes, the visitors turned on the screws on their rivals, striking through goals from Sean Rooney (49th minute) and Sunil Chhetri (64th minute) to enjoy a 2-0 lead. Substitute Balwant Singh struck a gem of a goal to infuse life in the game in the 74th minute but the visitors heaped more misery on Churchill with Chhetri scoring another goal just a minute later. The win helped Bengaluru FC open a five point gap at the top of the league ladder, while Churchill Brothers were consigned to the bottom of the pool. Both teams were unwilling to take risks at the start of the game and it needed 15 minutes for the first action to set it. It came from the visiting end, and through a free kick which Sean Rooney won and then smashed the resultant attempt into the side post. That was Bengaluru’s only attempt on goal in the first 45 minutes as Churchill slowly began to enforce themselves. India midfielder Lenny Rodrigues picked up Yasser Shahen inside the danger zone, and the Syrian striker did well to beat his marker with a body feint, but ended up with a weak attempt. Egyptian midfielder Abdel Hamid Shabana then found Shahen again but BFC goalkeeper Pawan Kumar remained alert to the danger. The match turned into an entertaining contest after the change of ends. Four minutes into the second half, Bengaluru FC tasted success as Rooney was allowed plenty of space to head home Lalrozama Fanai’s brilliant cross from the left. Bengaluru FC made it 2-0 when another brilliant piece of work from the right from Thoi Singh saw captain Chhetri give the finishing touches. Churchill seemed down and out but substitute striker Balwant Singh provided them with a glimmer of hope as his top-draw effort from just outside the box beat a diving Pawan Kumar. But just when Churchill were beginning to feel they could get something out of the game, Chhetri – who last year led Churchill to the title – punctured their hopes, capitalizing on a nice through ball from Darren Caldeira.